Arleen Auger Interview with Bruce Duffie . . . . . . . . . .
Arleen Joyce Auger, singer: born Los Angeles 19 September 1939; Professor of Music for Voice, University of Frankfurt 1975-87; died Leusden, The Netherlands 10 June 1993. The soprano Arleen Auger possessed a pure-toned voice of great flexibility and absolute accuracy of intonation. She excelled in the music of Monteverdi, Bach, Gluck, Haydn, Handel and in particular of Mozart, but also sang works by 20th-century composers such as Carl Orff with great success. Auger's voice was not large, but it was perfectly focused and so well projected that it could easily be heard in the biggest auditorium. During a career lasting 25 years, she appeared in opera and oratorio, on the concert platform and in recital both in Europe and the United States. 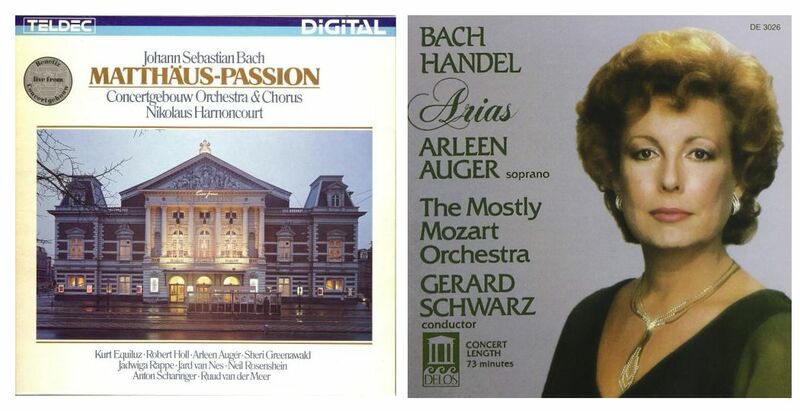 She made a vast number of records, which included more than 90 Bach cantatas. At the wedding of Prince Andrew (later the Duke of York) and Sarah Ferguson in Westminster Abbey, in 1986, she sang two Mozart anthems with the soprano Felicity Lott during the signing of the register. Auger was born in Los Angeles in 1939. After graduating from California State University at Long Beach, in 1963, she studied singing with Ralph Errolle in Chicago, making her professional debut in concert with the LA Philharmonic Orchestra. She won a scholarship to study in Vienna. Having auditioned for the conductor Josef Krips, she was engaged in 1967 at the Vienna State Opera, making her debut as the Queen of Night in Die Zauberflote. Her other roles in Vienna included Constanze in Die Entfuhrung aus dem Serail - which she later recorded with Karl Böhm - and Gilda in Rigoletto. At the Volksoper she sang Valencienne in Die lustige Witwe, Marie in La Fille du regiment and in 1972 created Alma in Kaufmann's Konig Nicolo. Gradually her repertory, which at first centred on spectacular coloratura roles such as the Queen of Night, which she repeated at Salzburg in 1970, Constanze and Marie, began to change. Though Sifare in Mitridate, re di Ponto, her second role at Salzburg, was extremely florid, Sandrina in Haydn's L'infedelta delusa, which she sang at the Castle of Hohenems Festival, and Servilia in La clemenza di Tito at the Theater an der Wien were more lyrical in style. As a change from Mozart, she sang Mabel in a German version of The Pirates of Penzance on Cologne Radio. In 1975, after touring Japan with a programme of music by Bach and Handel, she made her debut at La Scala, Milan, as the Fire in Ravel's L'Enfant et les sortileges, a temporary reversion to dazzling coloratura. So far, apart from singing the Queen of Night for New York City opera in 1969, Auger had spent her career mostly in Europe. After her Metropolitan debut in 1978 as a charming Marzelline in Fidelio, she sang more frequently in the United States. During the early 198Os she appeared at the Aspen Festival and the New England Bach Festival; she gave a recital at Alice Tully Hall in New York; she sang Donna Anna, a heavier role than any she had previously attempted, for Kentucky Opera, Louisville; she took the part of Amor in a concert performance of Gluck's Orfeo ed Euridice, conducted by Riccardo Muti at Carnegie Hall, and sang in Carl Orff's Carmina Burana with the Philadelphia Orchestra. Auger first sang the title-role of Handel's Alcina, one of her finest operatic characterisations, in a staged performance at Christ Church, Spitalfields, during the 1985 City of London Festival. Alcina, the beautiful sorceress, a part requiring great brilliance of vocal technique, as well as considerable dramatic power, remained a favourite with Auger, who recorded the opera and sang it in Los Angeles the following year. In 1990 she sang it at Geneva and then at the Theatre du Chatelet in Paris. 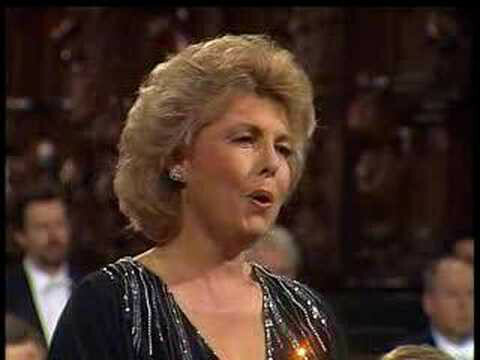 In 1987 Auger sang Ilia in a concert performance of Idomeneo at the Queen Elizabeth Hall, given by the Orchestra of the Age of Enlightenment, conducted by Simon Rattle; Ilia, the gentle but courageous princess, was another of the roles that she interpreted particularly well, both vocally and dramatically; the heroine of Monteverdi's L'incoronazione di Poppea, which she sang in 1988 at Spitalfields, and later recorded was, at that stage in her career, less suitable, although she sang Poppea's music very beautifully. She sang the Countess in Le nozze di Figaro at the Los Angeles Music Center in 1990, and the following year Lieder at the Hohenems Schubertiade. 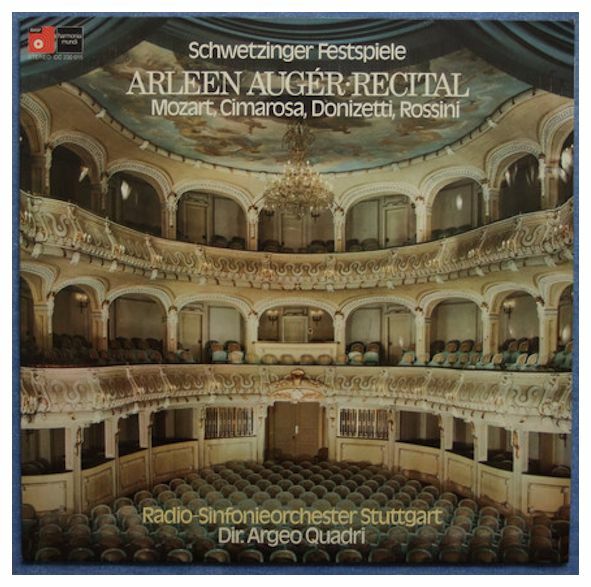 Throughout the 1970s, 1980s and early 1990s, Auger was kept busy recording a wide variety of music: Gluck's Iphigenie en Aulide, Mozart's early operas Il re pastore and Ascanio in Alba, as well as the Countess and both Donna Elvira and Donna Anna; the roles of Angelica in Haydn's Orlando Paladino and in Handel's Orlando provide another interesting contrast, while the Italian Soprano in Richard Strauss's Capriccio is a very successful departure from her usual repertory. She can also be heard, together with Della Jones, frequently her 'male' partner in Handel and Monteverdi operas, as one of the two Nursemaids in Kurt Weill's Street Scene. Although her last name sometimes appears with a diacritical mark, it is not used in the obituary shown above. However, since it does appear in both the Grove Dictionary (edited by Stanley Sadie) and Baker’s Biographical Dictionary (edited by Nicolas Slonimsky), I have opted to use it on this webpage. She pronounced it for me as oh-ZHAY. In August of 1985, Augér was in Chicago for programs of Bach and Brahms with the Grant Park Festival Orchestra, and baritone Tom Krause. The conductor was Robert Shaw. The soprano was staying at the private residence of a friend, and as we were setting up, her host mentioned that she would turn off the telephone so it would not ring during the conversation... although the charming clock on her mantle did chime a couple of times! Bruce Duffie: Is the life of a singer too busy? AA: It’s not too busy, but it’s very busy. ‘Too’ is a very interesting word. I’m traveling all the time. I have for years now, and for the last couple of years I’m on the go all the time, so I really don’t have a feeling of home. Although I have a residence in New Hampshire, I’m almost never there. I’m dividing up my year between America and Europe, so I just change suitcases and go on. It’s a very, very busy life, and sometimes it seems that it’s getting close to the ‘too’... but it hasn’t gotten there yet. [Laughs] I’m trying now to arrange my time so that I have at least short periods of free time in between, which is difficult when important things come into an already full season, especially now that America has opened up for me. BD: You spent quite a bit of your earlier career in Europe? AA: Yes, it’s only been the last three years that I’ve been coming back to America at all, really. BD: Where’s your home base in Europe? AA: My home base now is Munich. I was in Frankfurt, but it’s more convenient for me now in Munich... though it’s really only to change suitcases, as I’m never there either. I’m constantly on the road, and until I decide which of the continents are going to be more of my year, I’m just going to have to accept the fact that I am never home, because when I’m free, I’m in the other part of the world. I’ve built a very solid career in Europe, and I don’t want to give it up. I like working in Europe very much. I like living in Europe very much. I’m very pleased that America has opened up as it has, and that year after year it opens up more. I just have to make sure that I can combine the two for at least a few years, and then where I’ll settle down I don’t know yet. I definitely want to teach. I love to teach, and I think I would like to teach in America, so it looks as if I would plan to come back at some point and have a good portion of my year in America. But I’m not at that point now. America continues to develop, and opera is developing again, so I just can’t say no to Europe, at least not yet. BD: What was the original impetus to go to Europe in the first place? You’re an American singer, yet you packed up and went to Europe. AA: That’s right. I had studied here in Chicago until my money absolutely completely ran out. I packed the rest of my few belongings in my little VW, and drove back to Los Angeles, which was my home. It was late Spring, and I knew that if I did not get some kind of work singing by the Fall, I would have to get another teaching job to support myself. That’s why I went back to California where I have my teaching credentials. I started some coaching in Los Angeles as soon I arrived, and was singing for everyone possible with the hope of finding some kind of opera work for the next season, and maybe a good church job, too, to tie me over. But as fate would take it, my coach after the first lesson got on the telephone, and although the date for entering the contest had passed, he arranged for me to still be allowed to enter a local contest, sponsored by a group of Viennese people. That contest had taken place in June, and I won first place, which I was not ready for. I wanted to second or third if I was going to win anything at all because it was money. But first place was no money, just a seat on their flights to Europe in the Fall and an audition at the Vienna City Opera. So I went in September, not speaking any German and only singing the two Queen of the Night arias and the Olympia aria. I went to the Volksoper and auditioned, and they gave me a trial evening as the Queen of the Night for November. This was September, and I was supposed to fly back to the States in October with this Viennese charter flight. But I said I’d stay and do this performance, and somehow, with the engagement fee I would fly my way back to America. But the day after this audition in September, the Vienna State Opera called and wanted to hear me. They had heard that someone had sung the Queen of the Night, so I went down the next day and auditioned, and they wanted me to come back the following day to sing for the directors, which I did. They offered me a two-month contract to learn Naiad in Ariadne auf Naxos, and if I did well on that, they would offer me the rest of a two-year contract. So within a few days I was already engaged at the Vienna State Opera! This was after all of the opera directors in America had heard me during the previous six months, and had said very interestingly they’d watch me, but I got no jobs. BD: Did you fulfill the original engagement and sing at the Volksoper? AA: I did, but before that I had already made my debut as the Queen of the Night in the Vienna State Opera with Josef Krips. BD: They don’t come any better than that! AA: They certainly don’t! I did a lot of opera evenings with Krips in the last years that he was there. AA: The secret of singing Mozart, first of all, is a very solid technique, so you do not have to think about or worry about your voice, or the placement of the voice, or whether the next tone is going to be there. From that point on, it’s very important to have a feeling of the vocal line, a musical line. Being such a pure music form, you can’t cheat, so you must sing with great integrity to be a Mozart singer. Then you must have a love of the style that Mozart represents, and I do. I’ve always done, and I still do. I love to sing Mozart anytime. BD: So it doesn’t bother you to be called a Mozart singer? AA: Absolutely not! I’ve had more difficulty being pegged as a Bach Singer, although I’ve sung a great deal of Bach. But I don’t want to be labeled as a Bach singer. I am a singer, and being called a Mozart singer is a compliment. A Bach singer is also a compliment because it’s very difficult to sing! [Both laugh] It’s very difficult to sing cleanly, and like an instrument. All due respect to Bach, Mozart is much easier to sing. Although it’s extremely difficult music, he wrote for the voice, so you can sing like a voice. You can use your instrument like a voice. With Bach, you must use your instrument as an instrument. But if you can do both, terrific! It’s very satisfying. But to be a Mozart singer is a great compliment. BD: You started out singing the Queen of the Night and all of these high-flying roles. Did Mozart write enough of these high-lying roles? AA: Part of the problem with Mozart’s operas for me is the tessitura of his heroines in the ensembles, but not in the arias as I’ve sung a lot of Konstanzes. To sing her arias is difficult enough, but for me the difficulty of that role is the tessitura in the quartet and in the duet. 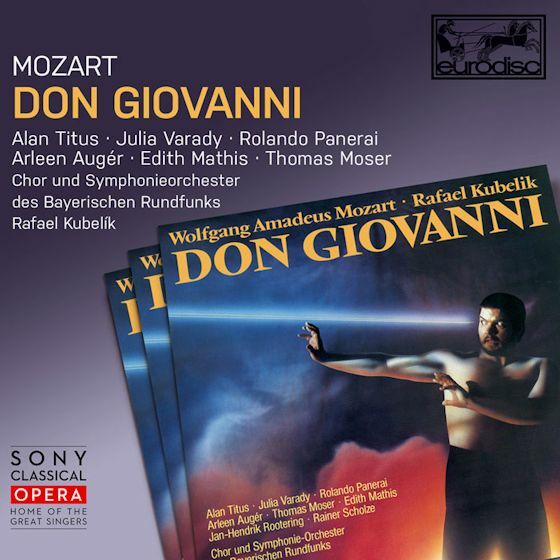 I have sung Donna Anna, and now I’ve recorded Donna Elvira, and because of the tessitura in the ensembles, Donna Elvira is more comfortable for me than Donna Anna. So with my voice I must be careful where the tessitura lies, not just for the high notes because I can still sing Fs as the Queen of the Night. AA: I had not even worked on either of the roles when I got the opportunity to sing Don Giovanni. I had hoped that I would be able to asked to sing the Donna Elvira because it’s a more interesting character, and I felt from the very beginning the tessitura would be more to my liking. But it was necessary for me to do Donna Anna in the production a couple of years ago, so I did and it went fine. I know how to handle this kind of thing, but in the production, I observed the Donna Elvira role as much as my own. Then I was very pleased this last Spring to be able to record the Donna Elvira, and I now have a couple of offers to do her. I’ll be very happy to go into that role and give it a go, but for every singer it’s very important to know the kind of range where your voice fits best, and to choose the roles that you do. You must be more careful than the people around you who are choosing things for you. BD: [Mildly shocked] You don’t find that your agent looks out for you and your voice??? AA: I don’t think anyone really does anymore. It’s really all our responsibility to know whether we can do something or not. Everyone is too busy doing their careers now. I don’t mean to criticize other people, but it’s just the way our business is now. Conductors are interested in their own international careers, and are less interested in taking chances on young voices. So the tendency is to use the same ones that they know and can have a guarantee of a satisfactory performance. The way up is more difficult now. I’m very pleased that I come up in my career with good conductors, and am now at the point where I am going to be able to be used again and again by them, and not have to try to get to a conductor to take a chance on me. But it’s very difficult. BD: Just as the conductors would like to have experienced and reputable singers, would you prefer to have an experienced and reputable conductor? AA: I would prefer to know that the conductor with whom I’m going to work is terrific! [Laughs] I do have luck in that the conductors I’ve come tougher with now are good conductors. I also have had great luck with most of the conductors I have worked with. I’ve been asked back again and again, as is the case with Robert Shaw this week in Grant Park. 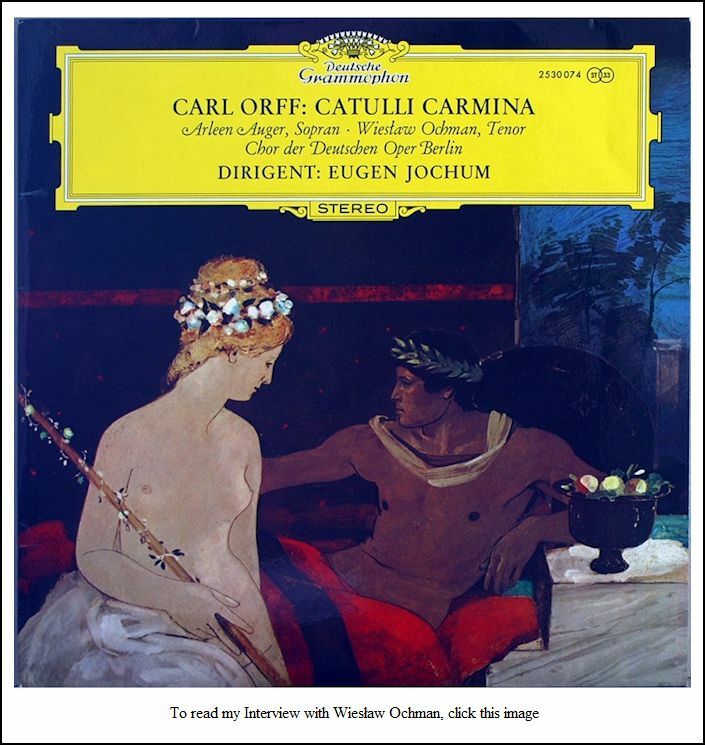 With him I was able to start with a piece of music for the first time that I liked very much — the Brahms Requiem. He and I hit it off right away, and we’ve had no trouble understanding each other. So it’s easy to go back again and again, and know that it’s going to be a wonderful experience. But I’ve had luck with many conductors that way from the very beginning. At the Vienna State Opera, I was working immediately with people like Krips and Böhm, and they wanted me again and again. It was a very good calling-card, so I got to meet other good conductors, and have other good radio opportunities and recordings. From that point on, it’s developed. I won’t say that I haven’t had my share of conductors who were not so good, or colleagues who were not so good, but it has not been as horrible a struggle as some other people have had to endure. BD: What happens when you have to work with a conductor who is perhaps not as brilliant as Krips or Böhm? AA: We can work psychologically a lot more with one another than we usually do. Each person has his good points as well as bad points, and most people concentrate too long on the bad points and make difficulties for one another. I try very hard to find the good points of musicianship, or interest, or style, and build on those things and try to minimize the dangers or the inadequacies. It’s almost always possible to raise the level of the performance by finding the common ground. BD: That is a very optimistic view. Are you optimistic in general about the future of opera? BD: Is that perhaps why some of the big-named directors, like Ponnelle and Zeffirelli, are spending so much time rehearing and demanding now that casts be kept together? AA: Yes, absolutely, because the speed to mediocrity is phenomenal in Europe. I’m not saying that normal performances elsewhere are always top-notch. I don’t know. I hear that sometimes later performances are somewhat make-shift, and I’m always disappointed to hear that because opera can be a wonderful form for audiences today, but only if it’s done well. If it’s not done well, the audience has a right to say that it’s an antiquated form, and it’s not very interesting, and it doesn’t speak to us today. They’re absolutely right. It doesn’t speak to me either if it’s mediocre. BD: So, opera can speak to us today, but it must be made to? AA: Absolutely! I just did a production in London of a Handel opera, Alcina. Joseph Losey (1909-1984) was to do the staging, but he passed away a year ago, and this production had been planned for two years. It was on and off again, and I was so interested in the concept of this opera company in London that I kept this date open, and very late it all came together. The role of Alcina is a very large and very difficult one, but I learned it very late because I wanted to do this production. The idea that this young opera company in London is to be as true to the form as one possibly can be on a minimum budget to do a first-class opera production. It had to do more with illusion and with simple honestly and good musicians, and we proved that it is absolutely possible. It was one of the greatest successes that I have ever experienced. BD: The public responded to it? AA: Wholeheartedly! Without an exception, the press was fascinated and happy to accept the concept and the result. BD: Which company was this? AA: It’s the young opera company called the Opera Studio in London. They’ve done a couple of productions, and this has been such a success that we’re going to do another production in 1987 with the original instruments in chosen buildings that enhance the opera atmosphere, always with good acoustics and with intimacy for the public. We did this production in the round, and had a maximum of 400 people in the theater. Later in the second theater there was a maximum of 600 people. There was intimacy and closeness and concentration, and had the absolutely dedication of every person involved. The cast was there for everyone else, and were totally interested in the production and not in themselves. [Note: This box contains a review of the recording by Brian Robins, the text of which appeared in Fanfare magazine. 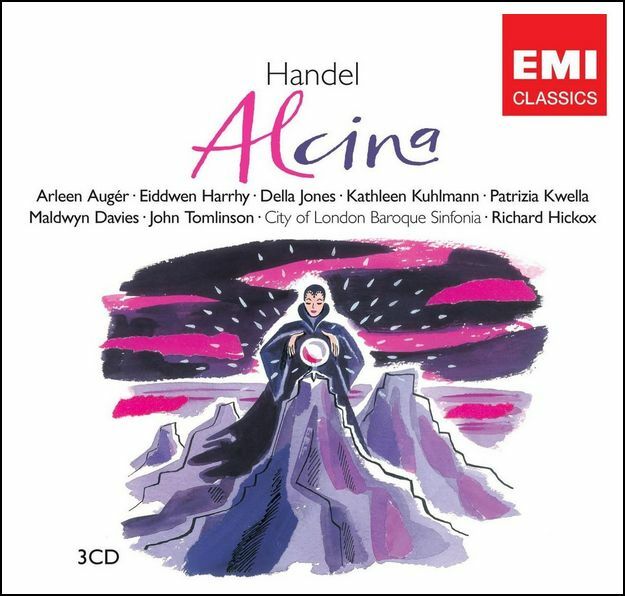 Richard Hickox’s recording of Alcina stemmed from a highly effective production by Frank Corsaro, first given at Hawksmoor’s wonderful Christ Church, Spitalfields in London in July 1985, and subsequently at the Cheltenham Festival later the same month. The studio recording was made at the same time as the British performances, while the production was also seen in Los Angeles the following year. 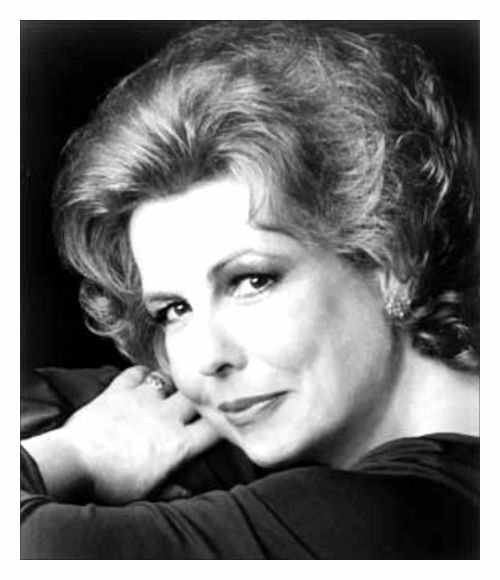 The second reason is Arleen Augér’s singing of the title role, a wonderful testament to the American soprano who is today still lamented following her tragically early death in 1993. Not only was Augér in glorious voice at the time the recording was made, but her Alcina is outstanding for the depth and insight she brings to one of Handel’s most complex heroines. “Di’, cor mio,” Alcina’s first aria, instantly brings us face to face with a woman well aware of her sensual powers, yet at the same time one who is equally prey to fragility and vulnerability. Later in the same act, “Sì; son quella” leaves ambivalent feelings. Is this a woman turning on feminine wiles? Or one suffering bitter hurt, as the change of tonal color on the word “traditore” suggests? Augér cleverly leaves us guessing. In act II, she makes the most of the brilliantly dramatic surprise at “Ah! mio cor!”, a point at which we expect a brilliant coloratura outburst of fury, but instead have our hearts wrung by the sorceress’s almost unbearable pain—listen to Augér’s singing of “sola in pianto” (“alone and in tears”)—while in the B section the repeated, unanswerable word “Perche?” rings out inconsolably. 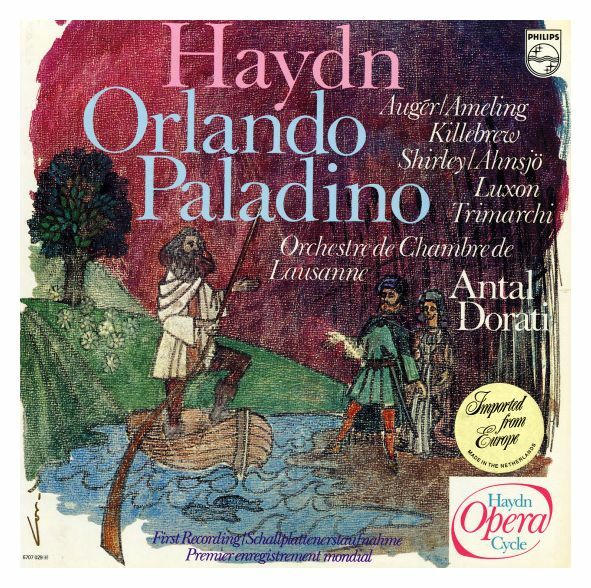 The great, accompanied recitative that precedes “Ombre pallide” is projected with spine-tingling intensity, while the latter sets the seal on a magnificent assumption of the role. I wrote “at least” above advisedly, for the performance has other strong merits, not least Kathleen Kuhlmann’s splendid Bradamante, a role she repeated some 15 years later with equal success for William Christie. There is, in fact, not a weak link in a cast completed largely by highly proficient and stylish British singers, although there are times when Della Jones’s vibrato is a little overdone. Particularly impressive is Maldwyn Davies’s Oronte, his elegantly produced tenor ideally suited to the charming minuet-tempo “Un momento di contento,” while Patrizia Kwella, a highly promising soprano whose career was set back by serious illness, makes for an enchanting Oberto who rises well to the challenge of “Barbara!”, the florid act III aria in which the page dares to confront Alcina. There is only one rival period performance, that of Christie (Erato), a version largely dismissed by both Bernard Jacobson and myself in Fanfare 24:1 on account of the wildly unstylish ornamentation employed by its star singers, Renée Fleming, Susan Graham, and Natalie Dessay. That is not a problem with the Hickox, where, apart from the odd over-exuberant flourish from Augér, embellishments are stylish and sensible. 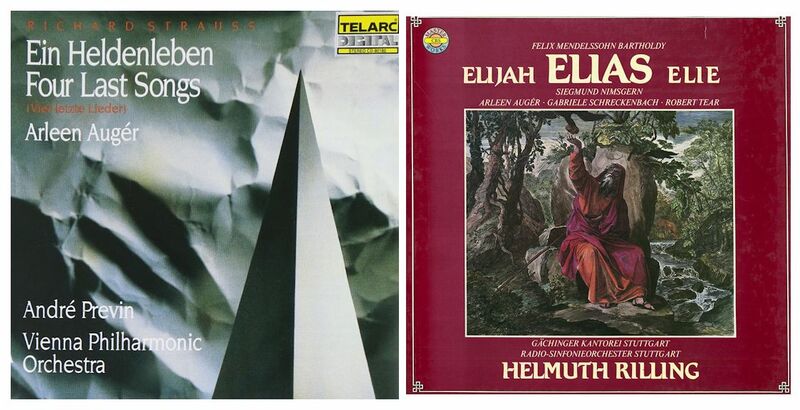 Those wishing to return to an earlier style of Handel performance—cuts, transpositions and all—are reminded of three recordings featuring a famous Alcina, Joan Sutherland, the recommendation of both Jacobson and another former Fanfare reviewer, Ralph V. Lucano, being for the one conducted by Ferdinand Leitner (Melodram). EMI has slightly altered the disposition of the three discs for the present reissue, giving better-placed changes that now leave the whole of the final disc devoted to act III. The sound remains very good. On the downside, there is no longer a libretto, although you can download it if you go to EMI’s Web site; and the excellent essay by Handel authority Anthony Hicks that accompanied the original issue has been dropped in place of a much briefer essay and a prosaic synopsis of the plot. It would be idle to claim that Hickox’s Alcina does full justice to one of Handel’s greatest operas. Yet it is unquestionably the best we have for the moment, and, above all, should be snapped up by anyone who appreciated the art of the much-missed Arleen Augér. BD: How can we get more of that kind of company? AA: We need to find more people who are interested and dedicated in doing it; where the opera experience, the obligation of artists to their art is more important than the money, or the ego-trip. I know that there are a lot of colleagues who are willing to consider these point before the money, but only under the right kind of circumstances. I have nothing against money, but I’m more interested in art, and I’m very interested in the operatic form if it’s done well. If not, I’m very happy doing concerts and recordings. BD: How do you balance your career opera/concert? AA: I still do a lot more concert work than opera. I’ve always enjoyed concert work, and song recitals are my biggest love. I know that the level of performance, the rehearsal schedule, the integrity of the musicians and the conductor, as well my own are much higher, much more easily satisfied in concert work than in opera. So, it’s a pleasure for me to do a great deal of concert work. BD: Is that because you only have yourself to rely on, to push into the highest means of expression? AA: Yes. You have to rely less on colleagues. I’m always disappointed when we have a quartet of soloists who are screaming like opera singers, and who are only interested in their own voice and their own line, and not interested in ensemble. I’m always interested in ensemble, whether it’s me with an orchestra, or me with a group of other soloists. I’m not as important as the music, and I’m always disappointed to see when other people are not as interested in music. But the longer you work and the higher you come in the profession, the better the chances are that you’re going to find good colleagues, and good conductors, and good orchestras who are interested in making music and enjoying music. So it’s worth the struggle up. These days, I’m pretty well guaranteed — ninety-nine per cent of the time — that I’m going to find this. Whether it comes off, depends on the situation, and there are no guarantees in this business! But the chances are good for my concerts, as are my recordings. Many artists would do a great deal of recording, and I love recording. I apparently have a good voice for a microphone, and I like the intensity and the striving towards the perfectionism. However, I’m not as interested in reaching perfectionism on the recording as the recording team. [Laughs] I would rather have some slight degree less than perfect, and have more musical life on a recording. AA: Yes. It’s been a tendency for years. Now that we’re more into digital, the tendency is lessening because it’s not so easy — or it’s impossible — for the technicians to splice and manipulate as much as it used to be. BD: So, the long takes are coming back? AA: The long takes are coming back. The interest for the musical life in a recording, rather than the sterile perfection, is certainly coming back. BD: Are the best recordings where you do them immediately after a round of live performances? AA: I do! We just made a recording for EMI from this Alcina, and we were recording in between performances, and at the end of the performance series, so were extremely involved in the characterization. It had much more depth of meaning every moment. What is difficult in recording is to do snippets and bits of things out of context, so this was much easier to get back to the original atmosphere, because we were performing it all the time. In just a recording — when maybe you’ve never done it, or you’ve not done it with this group, and the concept is different — to go from one portion to another is sometimes difficult to maintain your integrity to the entire piece. You would like to see the development of a whole piece. A good composer composes a piece from the vocal point of view in a developmental thought, and it’s very difficult to start at the end, and then come back to another state of the development of the character, or the vocal development of a piece. BD: It’s harder than even a rehearsal period, where you rehearse a scene and then rehearse another scene? AA: Absolutely because you can ‘mark’ [not sing full out all the time]. You can stay a little bit neutral. But in a performance situation you must go all the way. The more you all know the piece, the more you understand the concept of the development of the piece in the group with whom you’re working, and the better it is for a total recording. 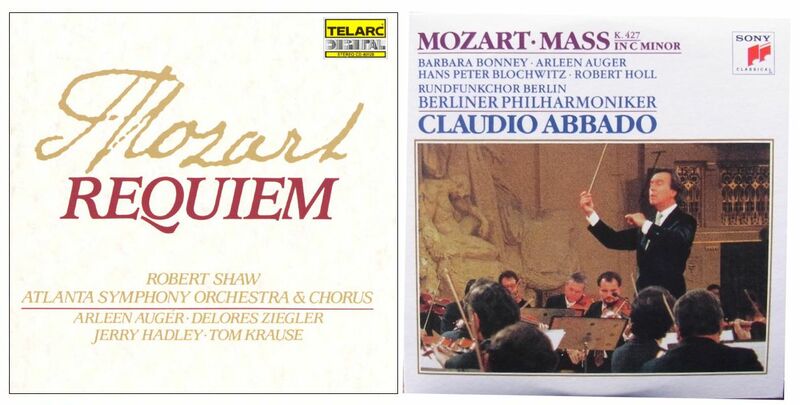 I’ve done some recordings of Mozart operas in Salzburg, where we did the recordings first and then the performance. BD: Did you wish it had been the other way? AA: Yes, we did! The more we did it, the more we wished it could have been organized, and the more we tried to inspire the organization to do it the other way around. But sometimes that isn’t possible. BD: Perhaps the recordings were being used partly as rehearsals for the performances? AA: That’s right. There are all kinds of reasons, and it’s a business. We have to accept that it is a business, and we have to go around unions and other people’s schedules, and time is money. It just is part of life. BD: Tell me about Alcina. What kind of a lady is she? AA: Alcina is a wonderful character. She is a sorceress on her own island, and for any shipwrecked person that comes ashore, she decides what she’s going to do with them — whether she’s going to turn them into persons of her court to serve her, or whether she’s going to immediately turn them into objects that she may want or need of any sort, or, particularly for the interesting men who come onto the island, turn them into lovers. Over the centuries she has had a wonderful collection of lovers that she keeps around her as long as they serve her well. But the moment they fall out of favor, she turns them into a rock or a tree or an animal. They’re all very afraid of this so they’re very much concerned with her well-being. The story is based on the moment when she’s initiating her newest lover who, shortly therefore, is saved from her clutches by his wife and brother who land on the island, and open his eyes to the sorcery. The conflict then is the development of this man’s strength to resist and Alcina’s fight to hold onto her whole existence. Good conquers evil, so at the end, Alcina loses her powers. She fights at the beginning with wiles and then magic, and later the wiles fail, and her magic fails for the first time in her life, of centuries of living. Each new lover has brought back her youth, so she has stayed young and beautiful. By losing this power, as a kind of Dorian Gray she loses her life, and in the end her magic powers are destroyed and all of the people, whom she has turned into objects, come back to life. So, it’s an adult Hansel and Gretel! [Both laugh] She loses everything. It’s a very fascinating character development for her, as well as for several of the others in the cast, and the power stays strong because of this conflict within the entire opera. It’s a four-hour opera. BD: You did it uncut? AA: We did it uncut, and we did three performances in a row. Then we did the recording, and then three more performances in a row. BD: Three days in a row??? AA: Yes, very, very difficult. It was a very difficult July. Anyway, it’s a marvelous opera. BD: How did they ever convince you to sing the principal role three days in a row, and then record it, and then sing three more days in a row? AA: [Laughs] I never do this kind of thing, never! I believe very strongly in having a bit of time between performances, especially opera performances. But the organizational problems in this production were upon us because of the death of Losey, and the change of casts several times. They were determined to get a good cast together, and not say, “We can’t get this person, so we’ll take this other person.” But if they couldn’t get someone that really believed in it, the whole thing would have been off. This was true of all of the cast. We had to work around a lot of other people’s schedules, and at the end we had to work around my schedule, too. So, it was extremely difficult to make this work at all. That’s why we finally ended up having to do several performances back to back. I was worried about having to do this, but apparently my voice suits Handel very well. I had absolutely no vocal problems staying fresh, partly because we were using original instruments, and we were only working in theaters where the acoustics were fantastic. No one was pressuring us to do anything that was against our vocal convictions. BD: And, as you mentioned earlier, these were very small theaters. AA: Small theaters and good ensemble, and the best of all possible worlds. Then it was possible. None of us had vocal problems, not even a tinge of tiredness at the last performance. Each performance got more and more exciting, and the intensity increased. It was really a very, very good example of the possibilities that we have today, under the very most limited financial situation you can possibly think of, to do absolutely excellent theater. BD: When you’re on stage singing an operatic role, are you Arleen Augér singing the role, or do you become that character? AA: I become that character. It’s required more and more of us in the opera field to be actors and actresses than it used to be. I find the acting part very fascinating, but it can only work if we have a stage director who is interested in giving us his concept, and helps us with all of his theater ability to reach our potential, not anyone else’s potentials. We have the greatest amount of freedom within his concept to develop our concept with him, so that we’re not doing his act and he’s not forced to do ours. We’re coming together as a team to find the best concept possible. BD: Do you find that directors like work within this freedom, or do they impose things? AA: I find most stage directors really don’t know anything about music. They really don’t know anything about singers, and the psyche of a singer, so most of us end up being told where to go like pieces of furniture. If they demand a concept, it’s their concept, and it may not have anything to do with our character as a person, as a singer, or as a performer. We’re being forced to take on some kind of a foreign object, put clothes on it, and make it convincing for the audience. I really feel that there are not enough stage directors in the world who really are ready to work in opera. They come from the theater, and some of them don’t know anything about music at all! It’s frightening. They are more and more in conflict with the conductor, and when the conductor comes into the scene, no one is really working together to make a concept. If singers were really great actors, we would be actors, and we wouldn’t be singers! So we need the guidance and the help to reach our highest acting potential with our voices as well as with our bodies, and most of the directors now are not ready to do that. We worked with Frank Corsaro this time, and he was fantastic. Ponnelle tends to do this sort of thing. I have several projects in the near future with Frank, and I hope that at least one or two of them will come to fruition. I like very much working with him. One stage director that I worked with on a rather modern opera [Melusine by Aribert Reimann] in Zurich some years was a television stage director, who had never done an opera before but loves classical music. He is fascinated with opera, and he gave his entire knowledge and patience and inspiration to our production to make it one of the best-staged opera productions that has come along in a long time. I still hear comments from people about the excitement of this rather difficult-to-take modern opera. But it was a fascinating piece. The opera itself was very good, and it had beautiful vocal lines for me. The orchestration was extremely modern, with very little contact to the vocal music, and it was a very difficult opera to make convincing. But the staging itself was a great success, and it was a wonderful joy to work with him. He’s done some operas since then, but he’s basically a television producer and stage director. But there are not very many who really love opera, who really know how to work with opera singers. We’re a hard group to work with, and we’re very concerned. BD: Thinking now of modern opera, are you a hard group to write for? AA: I don’t know. I’ve done very little modern opera. I’ve been fascinated with my young colleagues in America who seem so well-trained and interested in doing modern opera. There are also a number of young composers in America who seem to be going in a new direction of composition. BD: Is that a good direction? AA: I think it’s a good direction, yes. They seem to be writing more for the voice and the orchestral instruments. BD: Do they understand the voice? AA: I don’t know! I haven’t done their music myself yet, but they seem more interested in writing a vocal line. They often seem to be writing with the public in mind. These are concepts that are very basic, but many composers in this century have not been interested in the instrument, or whether it was possible for that instrument to do their ideas at all. They wrote it, and said, “This is it, and you must do it!” They were not interested in the public, or whether it was a musical form that the public would accept, or would be interested in finding out whether they could learn to accept. They found out that they may be writing very interesting things for themselves, and maybe for the future, but who knows? Certainly no one was interested in paying any attention to them. 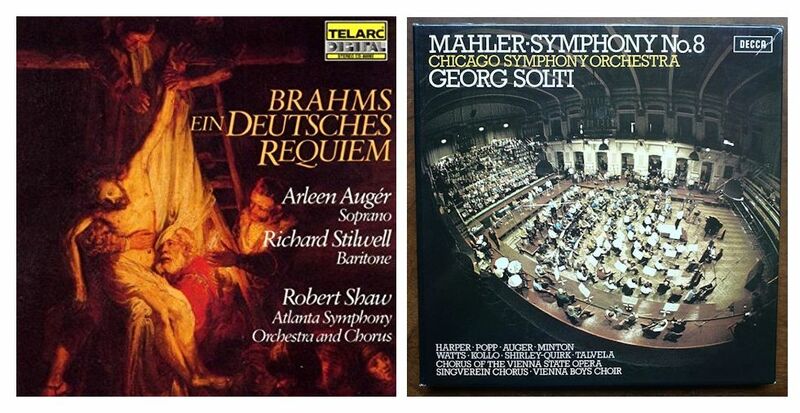 At least in Europe it has gotten to quite a standstill, and I’m very glad if American composers can come out of that corner, turn things around, and start a new direction of Twentieth Century music. They could possibly even bring in some concepts of other musical styles or rhythms, or even popular music. I’ve got nothing against that, as long as it brings it to a classical level of importance so it will be enduring. BD: For you, is Rock a viable form of music? AA: [Laughs] Oh, I’ve been too isolated too long! I’ve no idea. In hotel rooms, I watch MTV from time to time for short periods. My concentration level is not yet too strong on all of this. I’ve always been, first and foremost, interested in classical music, although I don’t come from a family which was particularly interested in classical music. BD: Let me turn the question around. How do we get the people who watch MTV all day and all night, to come to concerts and operas? AA: I think there’s at least there’s a certain portion of the audience for MTV who could have the basic interest in another musical form, and those people, if they choose their first experiences well, could find out that our musical forms have just as much value as the ones they’ve been used to. Some of them will discover that some of our greatest composers have written rhythmically just as strong and fascinating as those heard on MTV. If they want to get down to a deeper level of concept of text or meaning of musical sound, as some on MTV do, you can take it just for the rhythm and the sound, or you can go on to the text and the somewhat deeper concepts of some of the music. You can do that with classical music, too, and find out that we’re talking about philosophy and about deeper emotional states. If we do our job well, and try not to con the public or cheat the public, they’re going to find that our form of music also has value. I’m trying to do it with MTV, so why shouldn’t they do it with me... particularly if our Twentieth Century composition development continues to have the freedom of bringing in musical theater and popular music, including rock ’n’ roll, and I hope not too much punk. [Laughs] I can’t sing with clothes pins in cheeks, but some of the good of that direction could also be brought into our direction. Some of the composers of the earlier part of the twentieth century were doing that. Certainly Ravel, and Debussy, and Gershwin were all going in that direction. Somehow it got side-tracked, and the twelve-tone and experimental music took over, and it went more in another direction. We could possibly go back to the beginning of this century, then turn it into the second half of this century, and find some very fascinating forms, bringing several musical forms together that would very well appeal to a large audience, which will have to be our concept today. Whether it is classical or popular, music can only survive on a mass-basis because the whole industry is based on mass-production to make it possible to finance it. BD: So is this a good thing that opera and orchestral concerts go to television and video? AA: So as long as it’s done well. I’ve seen some things on television that work fantastically, are interesting, and well-representative of our art. On the other hand, I’ve seen a lot that, if I was not involved in classical music, I myself would say, “Well, if that’s classical music, I don’t like classical music. I really think that’s terrible.” There have been opera productions on television where I’ve been ashamed that it’s part of my art, because it’s terrible. BD: What makes it terrible? AA: If the performers have not been chosen for a criterion being the best of their art, then we’re not giving ourselves a chance for a mass group of people to find it acceptable. If we’re giving mediocrity, people will recognize it as mediocrity. Many producers and many television organizations have compromised where it shows. For something to be shown, we must decide if we’re going to do this production for television, or if we’re televising a stage-production. Then there are some simple rules that we should follow. If we’re going to televise an opera premiere from a theater somewhere, then we should keep the distance of the proscenium. It’s an injustice to my colleagues — or to me if I ever become involved in such a tremendously nerve-wracking experience. The camera has no right to penetrate for close-ups that we don’t know about. We have certain technical feats that we must accomplish in an opera production, and if the production is not made for the television camera, then we must fill an opera house and do certain technical things to make that possible. That has no business being shown in a close-up on a television camera. BD: Watching a singer produce a high note is not pretty! AA: It not pretty, and it was not intended to be pretty. From a distance it does not look ugly, and that’s why the proscenium. The magic part must be kept on the television. If the people on stage are satisfying the wishes of the stage director and the conductor for an opera house, then we have the obligation to perform illusion, and that illusion is only made by singing from a distance. The television camera has a tendency to pick up details, and has no respect for this art form. We on stage have no control over which moment the camera is breaking this magic. BD: This is even more so than someone in the balcony with binoculars? AA: Absolutely! That’s a personal thing. If that person sitting out there is not involved in the magic of the moment, and chooses to want to see how we’re working, that’s his business. If they’re going to do an opera production for television, then stage it as a film. Stage it as a concept and a proportion for the television screen, or for the film screen. BD: Could most of these live theater stage productions be adapted easily for an invited audience, where you don’t have to sing to the last row and you only sing to the first three rows so that it doesn’t look so labored? AA: I’ve seen things done in Europe that way. The audience knows they’re seeing a television adaptation of a stage production. BD: Someone could look right at the camera and then do an aside? AA: Yes. If we, knew which camera was on us every moment, then we would perform in that way. In a studio, they tell us in which measures Camera One will be on you. Then you know you don’t have to look at Camera One all the time, but you know how to work to visual advantage to that camera. Then you know when Camera Three is coming over and they want a profile, so you don’t go to that direction. Or they might want a half, or a three-quarters, or something else. You know how to deal with this on stage. They should tell you all of these things, and then it would be a staged television or film production. But they don’t! BD: So they are still the intruders, and you need more co-operation? AA: Very much so. Most of the time, people behind the cameras don’t know enough about the opera form, or the stage business for opera singers, and they’re constantly intruding. They’re always doing the wrong thing at the wrong time. BD: You should get the guy you said was a television producer, who’s staged operas, and take that experience. AA: That’s right. Television would never permit someone outside of their art form to come in and take over a production. They wouldn’t do it. They have their forms, and yet they’re intruding on our form, maybe not even knowing that they’re presenting the worst part of our form because they don’t know what in the world they’re doing. They’re not dumb, but they’re not flexible. BD: Are you happy with your audio recordings? AA: Well, yes, I guess so. I don’t really take much time to listen to my own recordings. Being a perfectionist, it’s always a bit of a shock. Most people don’t like to look at their own photos in the family album, and don’t really like to listen to their own voice on tape. So, they can imagine how difficult it is for us to listen to our efforts at representing the highest form that we can possibly do in any moment of our lives. By the time the recording has come out, we always feel we could have done it better if we had done it six months later. I do feel that several of my recordings have come out particularly well, and I am rather proud of them. I did a concert in a small baroque theater in Germany called Schwetzingen for South German Radio from Stuttgart. It was a theater that has been renovated now, but in its original form it was used for opera in the summer residence where Mozart stayed, and some of his operas and some of his evening performances were performed on that same stage. So it had a very emotional response from me, and I sang an opera aria evening. It was a very difficult evening, and it was being sent live for radio. If the concert went well, they would make a recording of it [cover shown at right], so it was very important for me to have this go well. All performances are important, but this one was very important for me at that time. I’m very pleased with the result, and it has been brought out again and again in re-pressings. I don’t know whether it’s available in America, but I hear again and again comments from people that it was a very, very beautiful concert. So, I’m glad it’s on record. 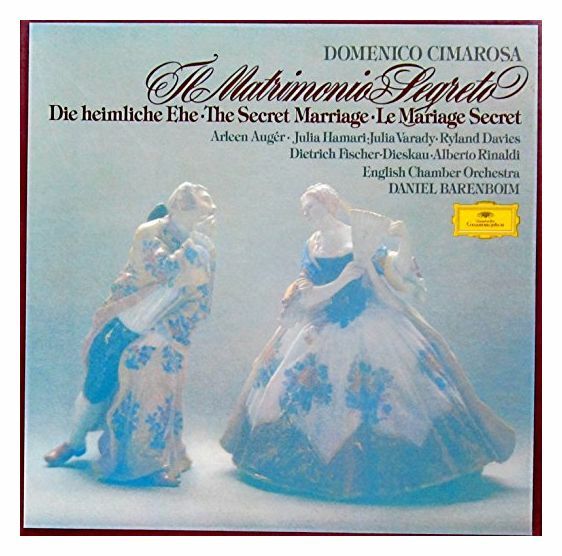 I’m basically very pleased with The Abduction from Seraglio with Böhm on Deutsche Grammophon. I still am getting comments on that, and now that I’m back in the States, I’m getting many comments here from people who meet me for the first time, and even from colleagues who looked around for an example of a recording that they wanted to listen to. They feel that recording is the classic example of our time, and that’s a very big compliment for me. At that time, Böhm was a very important conductor for me, and he chose me to do this role in spite of the fact that many people feel Konstanze should be sung in a more dramatic way. Böhm felt that Konstanze should be a lyric and not a dramatic characterization, and that’s why chose me. He was very pleased, and he commented at the time that I came the closest to his ideal, which was based on Maria Ivogün (1891-1987). From the few records that I have heard, she is an idol for me. BD: I remember being impressed with those old 78s of Ivogün. AA: Yes, and this is the direction of very true Mozart form and interpretation that got lost somewhere along the way. I would like very much to see the return of more lyricism, less shouting, and more integrated sound from the singers as well as orchestra. BD: It seems that what you’re wanting is more musicianship. AA: More musicianship, less devotion to loudness, and more devotion to sound balance. Sound balance is very important within an orchestra for soloists with an orchestra, ensemble singing, and ensemble playing. If the balance is not right, then certain chordal and emotional experiences will not take place. Most good composers have understood the balance of the chordal and the overtone effects on emotions. Any interval to another interval, or a series of intervals, has an emotional impact on the listener, and you can only get this phenomenon if the balance is correct in the room. If the balance from one source to another matches, and if you have one singer who is basically louder, or whose sound does not work well to another, you’re not going to achieve this effect. A composer puts one instrument with another for definite reasons to receive a sound, and it would never occur to us to change the instrumentation. For instance, instead of a flute and a clarinet making a sound together, if you can’t hear the clarinet, you’d put in a tuba. Who would do that??? But with soloists, it’s happening all the time. When the dynamic balance between a soloist and an orchestra is wrong, we have to work to be heard, and it will ruin every phenomenon that could possibly be there. Perhaps it is because the orchestra is too large, but the union says we can’t do a concert without eighty instrumentalists on the stage. So, we have a problem. Should we have two singers on the stage instead of one??? Who would buy that? No one would buy that today! The room that was the concept for the composer at the time he wrote the piece is completely different today when we have a hall for six thousand people and bad acoustics because it’s also used for conventions. If the adjustments aren’t made, then we have a problem. BD: Is this problem heightened when you sing with original-instrument orchestras? AA: Not necessarily. I enjoy singing with both. I agree with the idea of finding a balance true to the form of the composer. We can do that if we had the integrity and the courage to do it with modern instruments and in larger halls. The audience would just have to accept the fact that it may not be as loud as their stereo system can play at home. But a lot of people who are responsible for our concerts are not ready for this concept yet. BD: I hope that they get ready for it fairly soon. AA: I certainly hope so. Böhm never had a problem with that, and Krips never had a problem with that. There are some conductors today who insist that their orchestras play at dynamic levels to match the sections of the orchestra, or the soloists. They also might have the orchestra in a different seating arrangement, or put the soloists in a different place. Those are the ones who have integrity, and are interested in finding this balance, and they are doing it today. I don’t know whether it’s more than it used to be, but I’m finding it more than I used to, and I’m very happy about it. I find it’s a wonderful compliment if a conductor suggests or requests his orchestra to play piano when a piano is written. To permit a singer to sing piano when eighty people are playing requires that the orchestra play more softly than just piano, and why shouldn’t they? They’ve all learned to play their instruments. It’s just harder for them to do it correctly. Of course, it’s harder to do piano than forte, but it depends on the conductor. Then we’re back to egos again, and music should be above egos. Often it’s not, but should be. Music is strong enough on its own. Maybe we’re not strong enough if our ego is more important than the music. AA: [Laughs] I can’t be anything else! BD: [With a gentle nudge] But you said at the beginning you’re also a teacher, and I think you’d be a wonderful teacher. AA: [Smiles] Oh, I love teaching, yes. BD: I’m sure you bring ideas and concepts and tradition back into the studio. AA: I hope so. It’s one of my great aims. I’ve been saddened my entire life to see how few of my colleagues are, or were, interested in giving their art not only to beginners, but also to young professionals. At the beginning of my career, I missed having contact with great artists to receive suggestions, inspiration, and support, and maybe even help sometimes. Very often, help was given only for publicity reasons, but the great colleagues that I had offered their experience, and their comments, and their support freely. I never had the chance to really study with, or become near to gleaning experience of famous singers, or singers who had performed great art. It’s a shame when we don’t give our art on to other performers. It means that every generation has to learn the same mistakes, and make the same rocky progress. We could probably have generation after generation of great artists again if more colleagues gave their art instead of hiding it. So, if I have a purpose later, it will be for that. BD: I encourage that very much. AA: Thank you, I hope so. BD: Thank you so much for spending the time with me today. AA: It’s my pleasure. I’m glad to have the chance. I feel so strongly about our business and art, that it’s so important for people to talk about it. Not enough people are doing that. It’s important. This conversation was recorded in Evanston, Illinois, on August 21, 1985. Portions were broadcast on WNIB the following day, and again in 1989, 1990, 1992 and 1999. This transcription was made at the very beginning of 2018, and posted on this website at that time. My thanks to British soprano Una Barry for her help in preparing this website presentation.